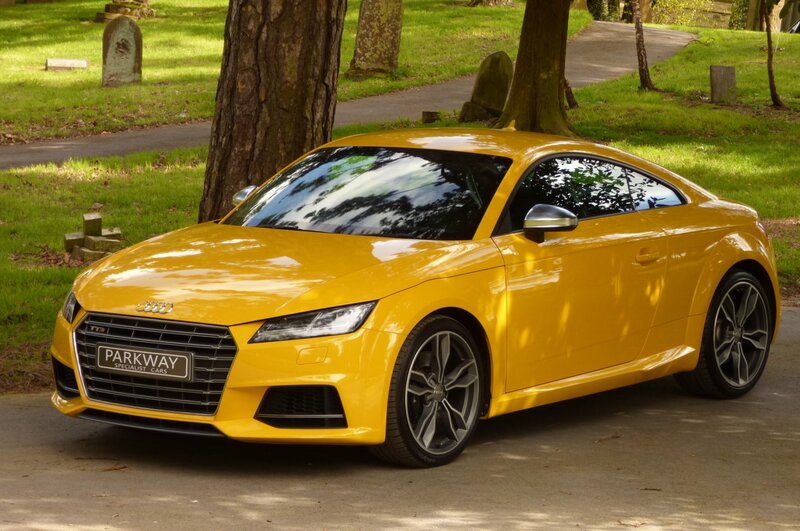 The First Audi TT Concept Car Was Unveiled At The 1995 Frankfurt Motor Show, With The First Production Car Being Launched In 1998 And Offered Clients An All New Modern Take On The Coupe Design, Perfect For Both The Ladies And Gents. 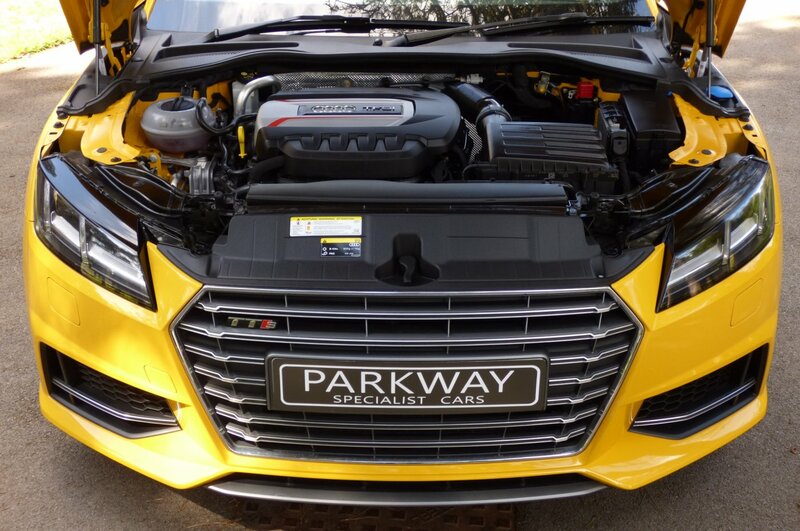 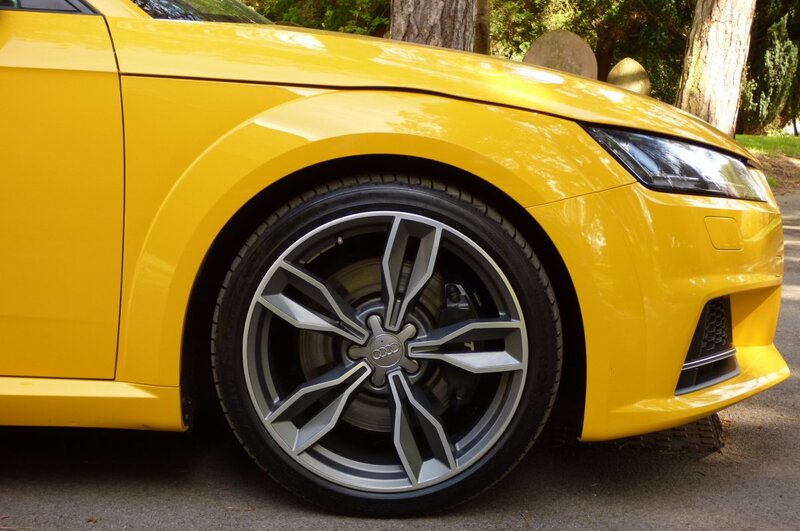 The Cars Had The Perfect Collaboration Of Fabulous Styling, Impressive Engine Choices, High End World Class Leading Technology, All Of Which Made This Model One Of The Most Successfully Vehicles To From The Ingolstadt Production Line In Germany. 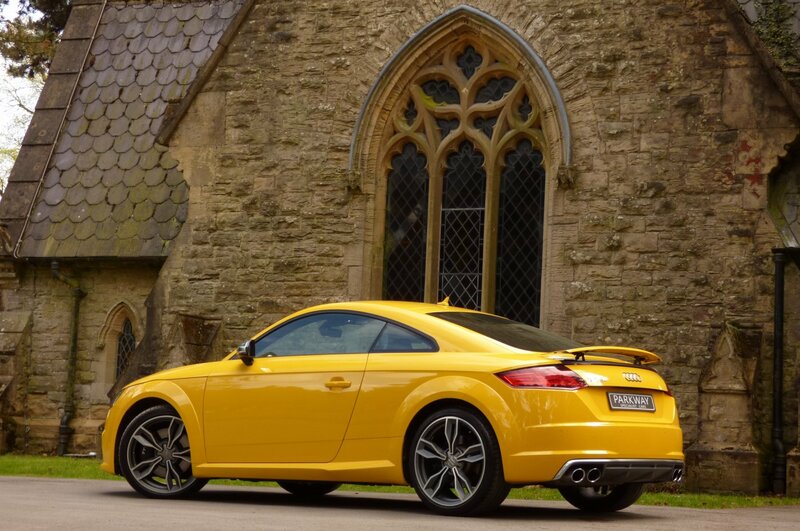 The Third Generation Audi TT Which Was Released To The Eager Motoring Press At The 2014 Audi All-road Shooting Brake Concept Car In Detroit And Was To Set An All New Benchmark For The Company On Advanced Specification, But At The Same Point Still Followed Similar Design Lines That Had Been So Successful For Nearly Twenty Years. 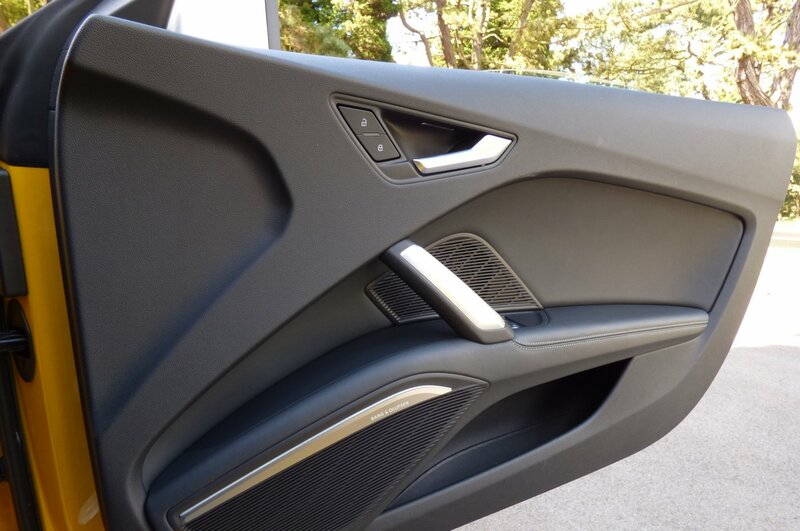 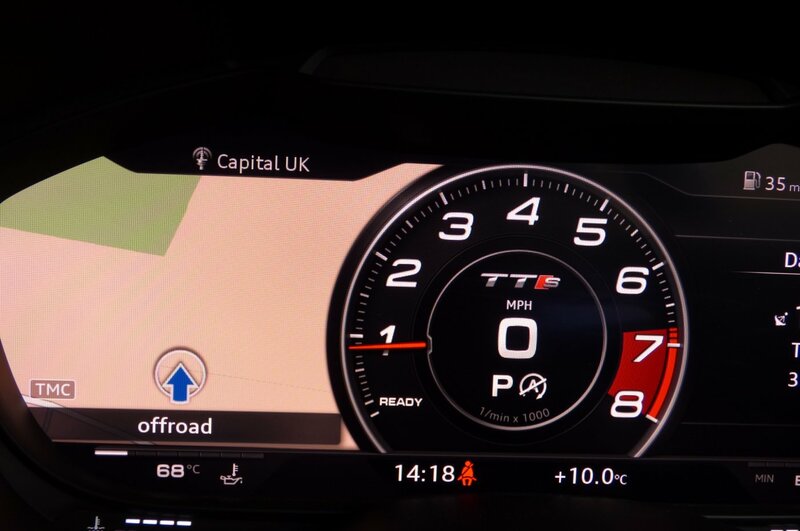 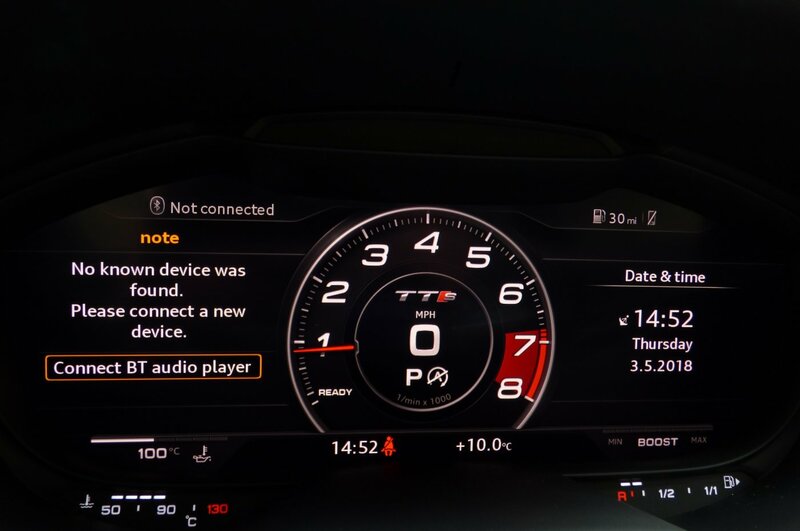 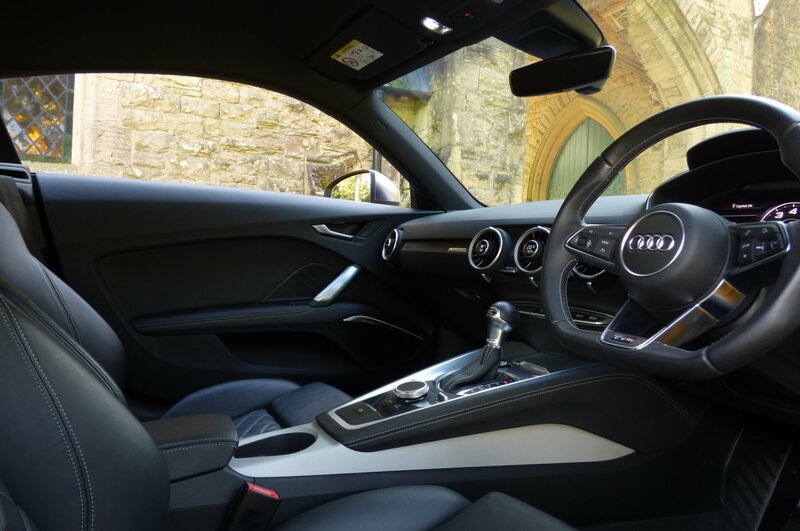 With Its Radical New Interior Design To Include The Stunning Immersive Cockpit Display And Integrated Climate Control Buttons, It Was Seen By Many As A Truly Stunning Interior With It's Mix Of Sleek Styling And Forward-Thinking Technology, It Became An Over Night Triumph With Those Dedicated Audi Buyers Excited To Get To The Showrooms And Get Their Own Order Down On Paper. 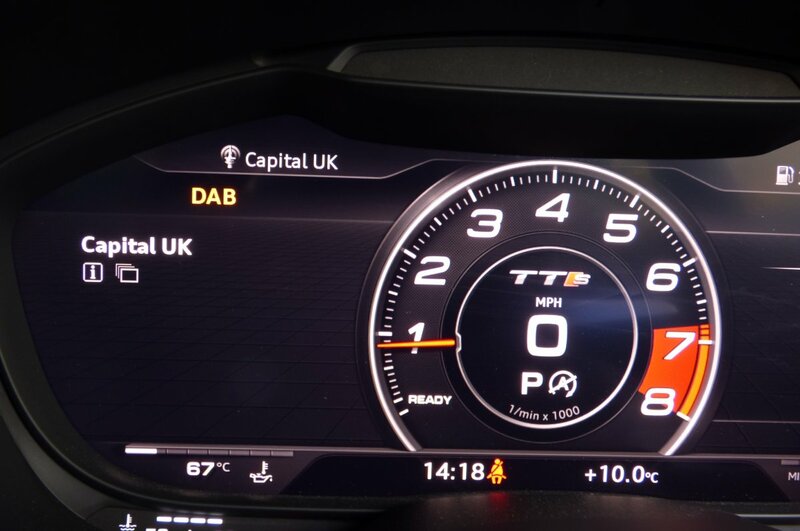 The TTS Was To Be Powered By The 2.0 TFSI Engine Producing A Whopping 306BHP And Teamed With Twinned With The Quick Changing 6-Speed S-Tronic Transmission Gearbox, Would Easily Accelerate Both Driver And Passengers From 0-62 In Just 4.6 Seconds, Would Further Climb To A Top Speed Of 155MPH, All Of Which Elegantly Controlled By The Impressive Audi Four Wheel Drive System. 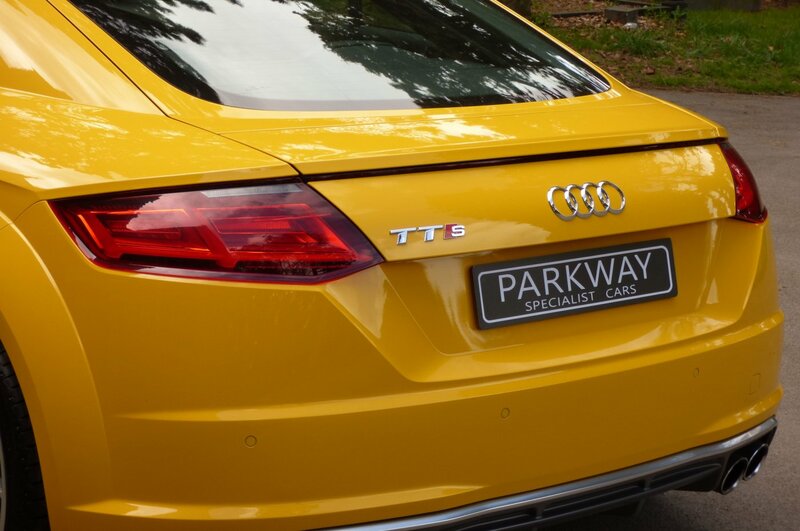 The All New TTS Would Definitely Give Other Car Manufactures A Proper Headache, With The Porsche Cayman To Be First On Their Hit List. 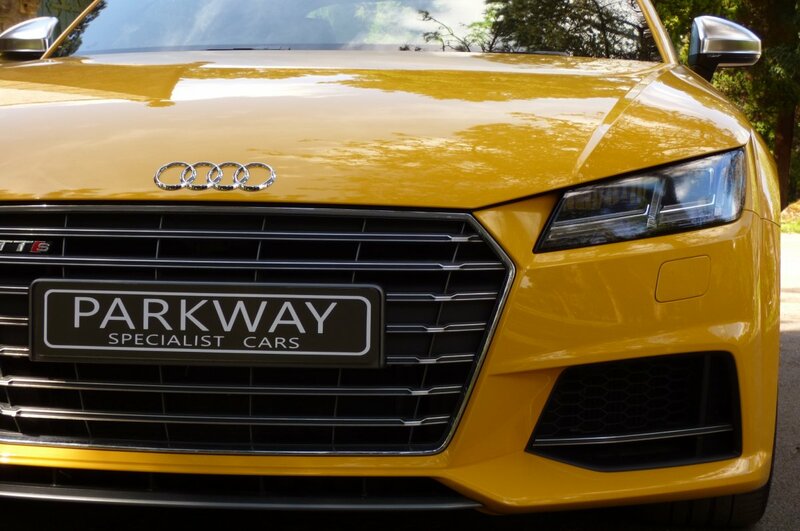 Our Fabulous Example Has Completed Just 10749 Miles Since Being Registered On The 1st July 2015, And Has Been Treated To A Full Main Dealer History With Visits At 2145, 6798 Miles And Will Undergo A Further Full Service Completed By Our Fully Trained And Knowledgeable Workshop, Which Will Include A Brake Fluid Change And An All-Wheel Drive Coupling Oil Change Prior To The Next Keeper Taking Delivery Of This Example. 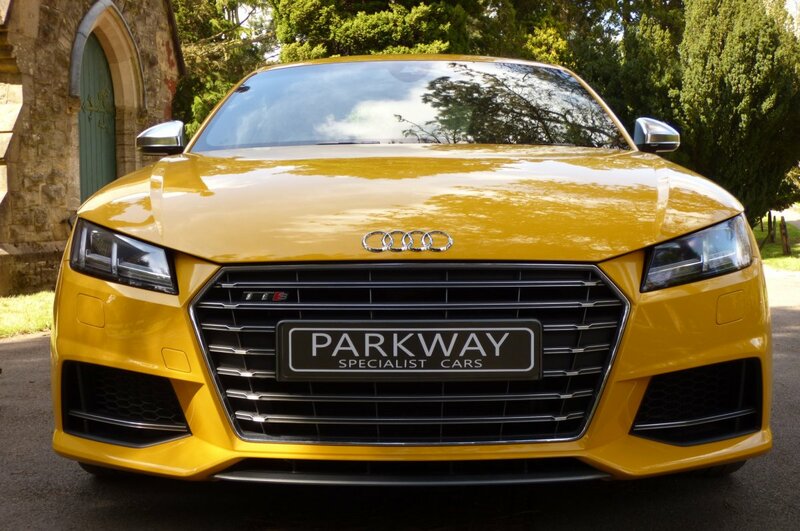 Once Sold This Spectacular Example Will Be Presented With The Entire Booklet Pack Set, A Fully Cleared Hpi Certificate, A Fully Functional Key Set And The Original Factory Build Sheet, Which Lists All The Expensive Options From New, Which Is All Is Place For That Next Lucky Custodian To Keep And Cherish During Their Own Ownership. 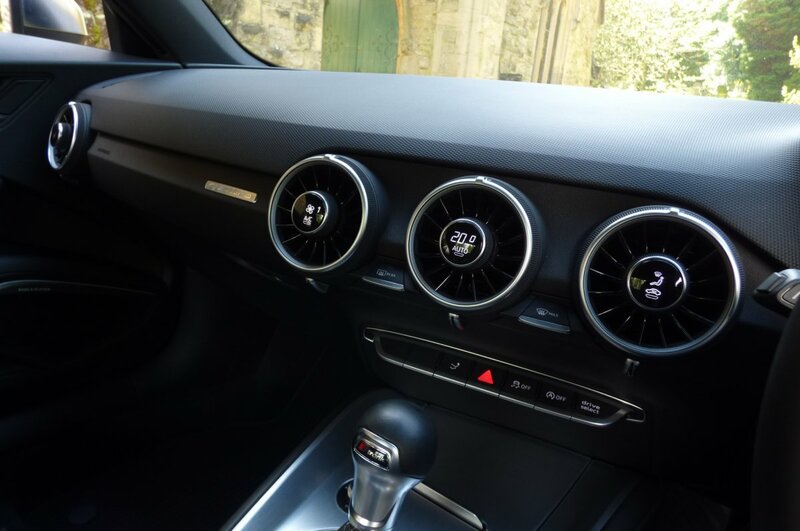 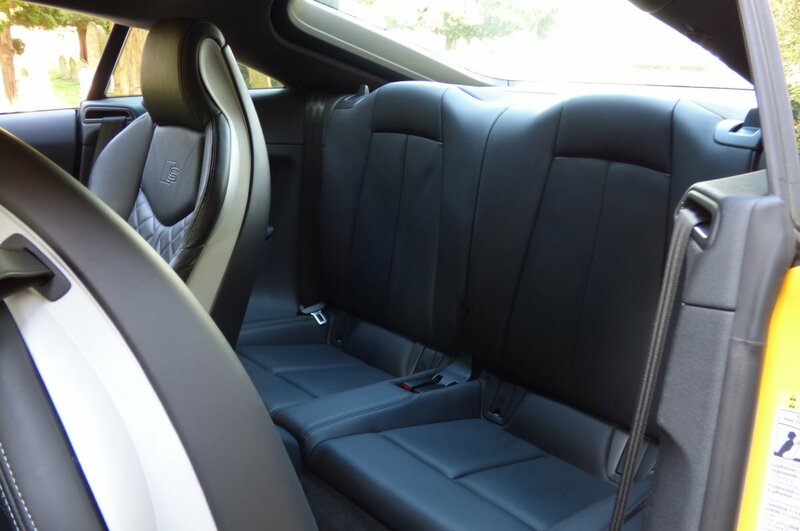 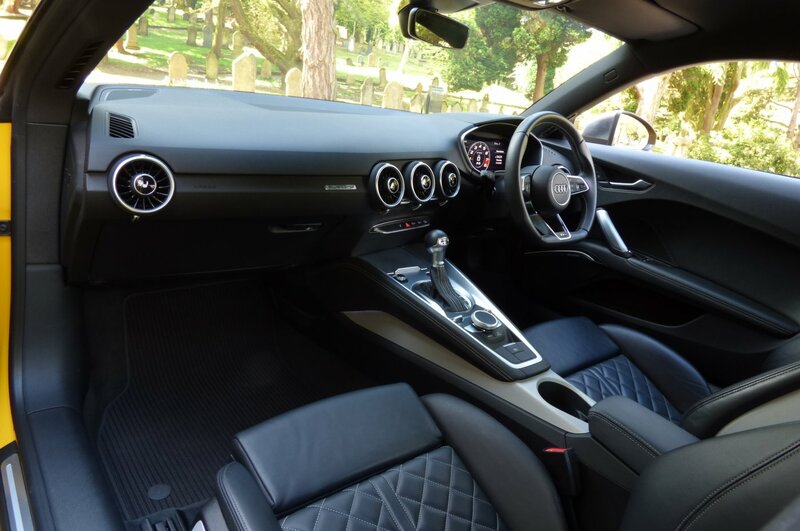 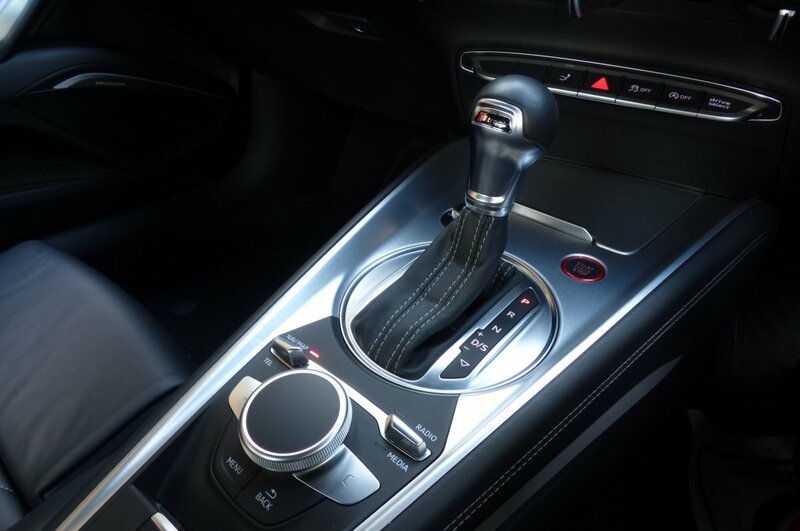 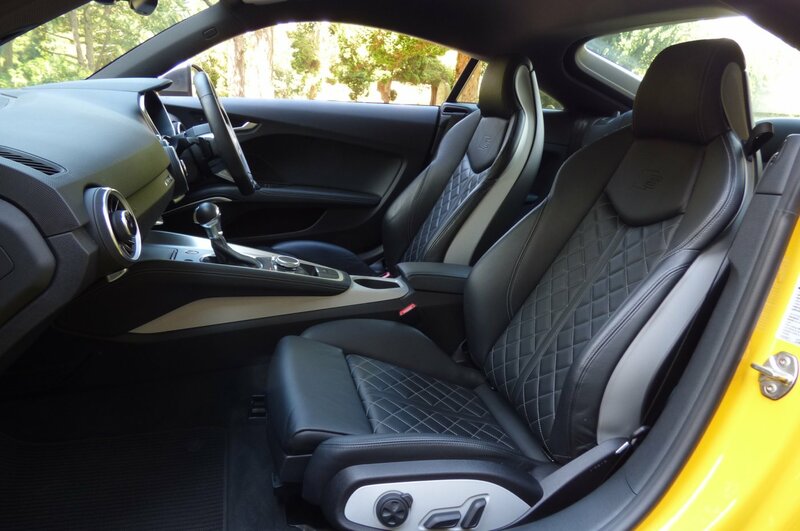 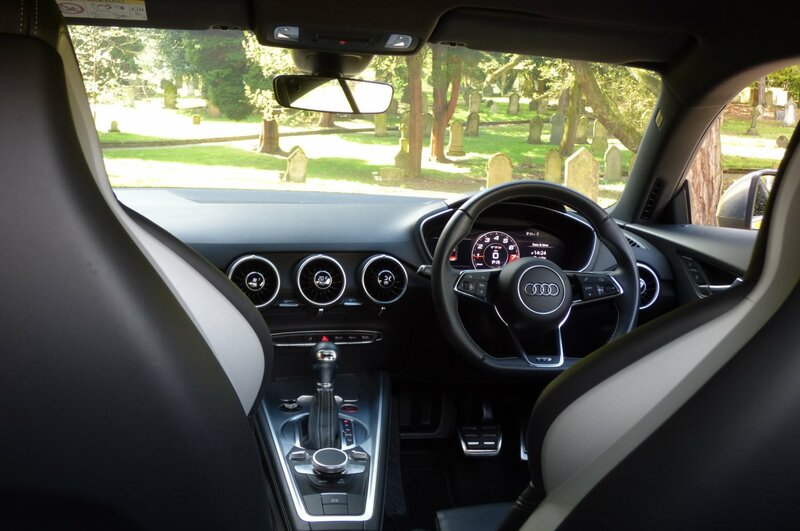 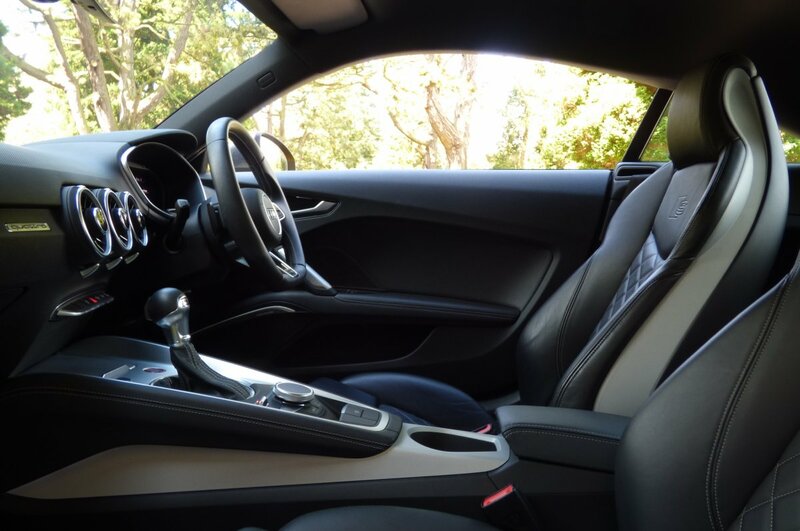 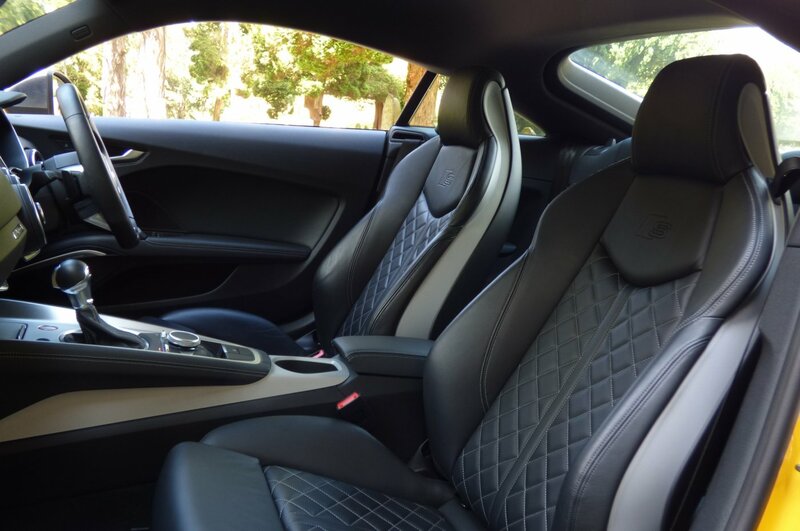 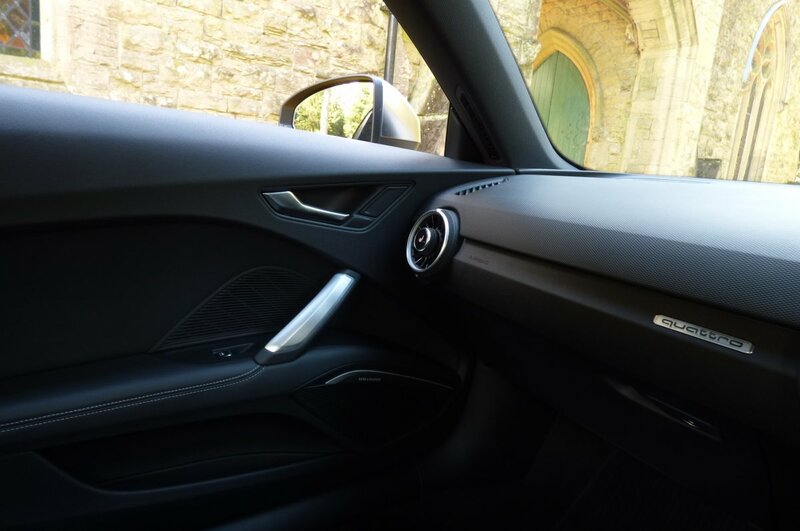 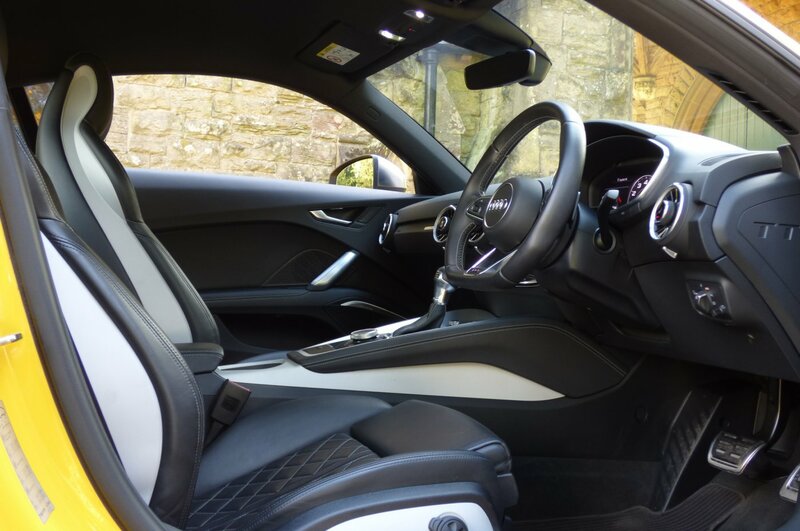 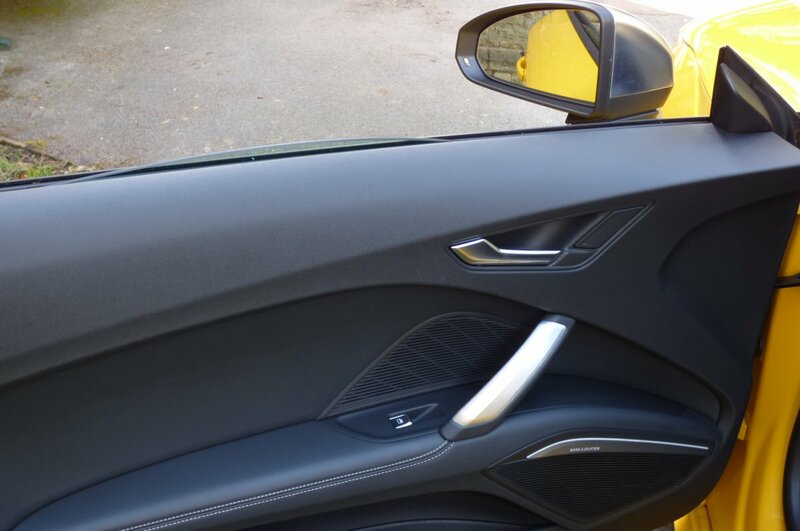 The Interior Of The Audi TTS Is A Simplistic, Yet Stylish Design Packed With Modern Day Technology And Those Creature Comforts We All Need In Today's Modern Vehicles. 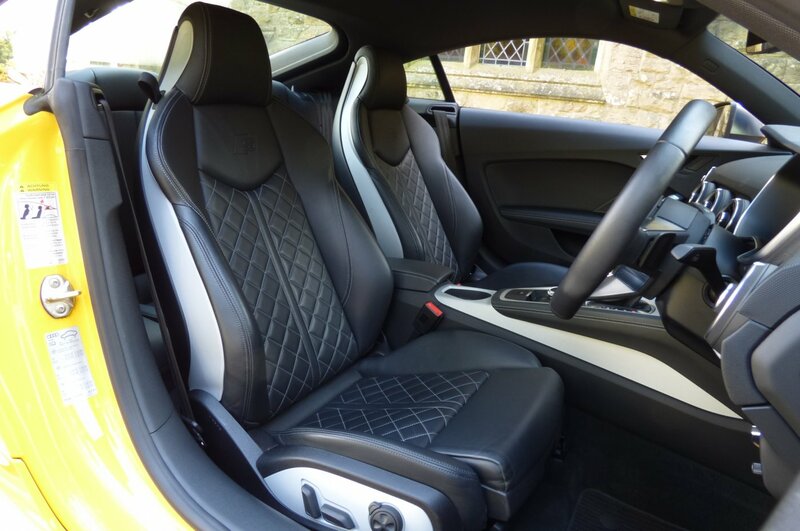 From Factory Our Example Was Opted With The 'S' Embossed Quilted Black Fine Nappa Leather Sports Seats Beautifully Complemented With Silver Contrast Stitch Detail, The Quattro Embossed Black Dashboard That Wraps Around This Exciting Cabin, The Fine Black Leather Trimmed Door Cards, The Black Fabric Roof Lining, Seat Side Bolsters In Black Fine Nappa Leather, Black Floor Carpets Which Have Been Protected By Black Audi Floor Mats, The Three Spoke Flat Bottomed Leather Bound Multi-Function Steering With Paddle Shift Function, Seat Heating And Climate Control Digital Buttons That Integrate Perfectly Into The Front Air Vents And Decorated With The Matt Brushed Aluminium Inlays That Finalise This Dramatic Interior Off So Very Well. 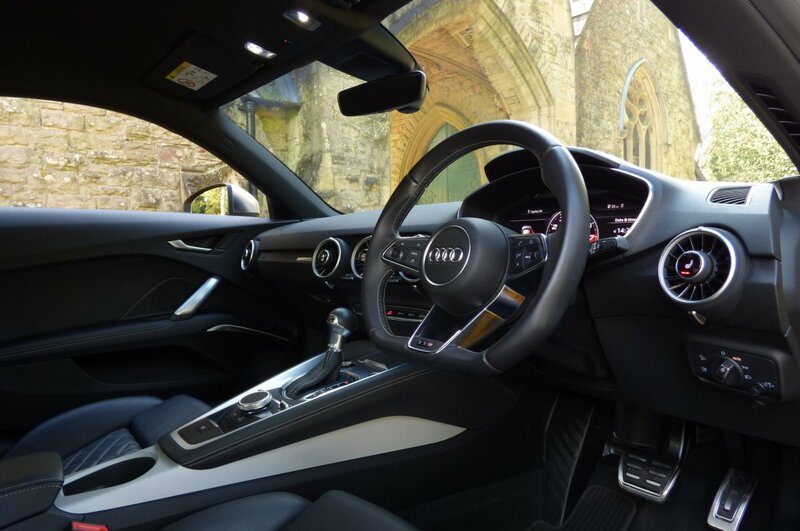 The Interior Offers A Wide Range Of Important Audi Factory Options, All Which Makes Every Journey Highly Enjoyable And Perfectly Controlled No Matter The Distance. 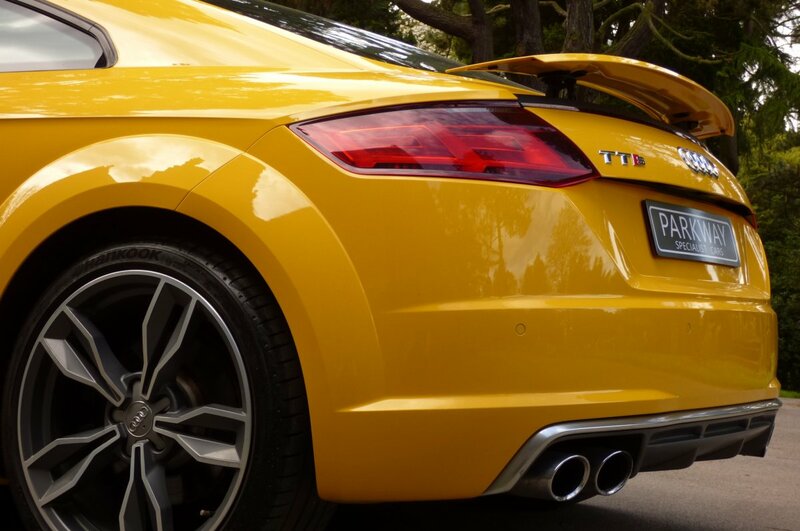 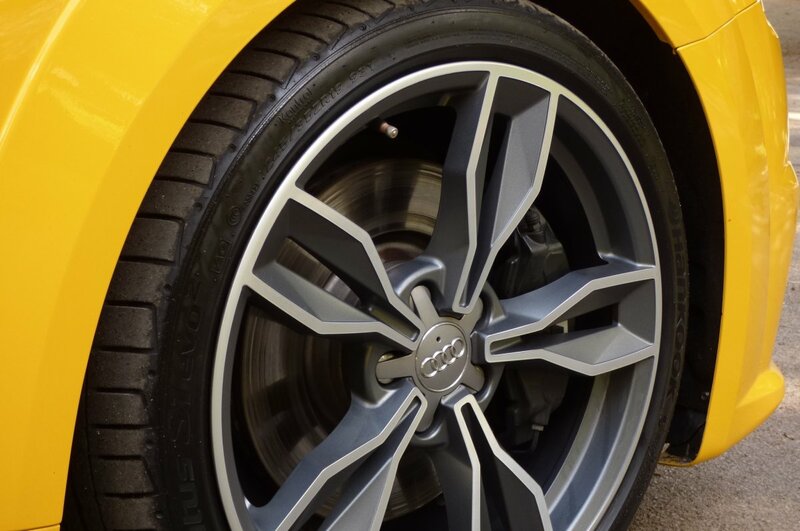 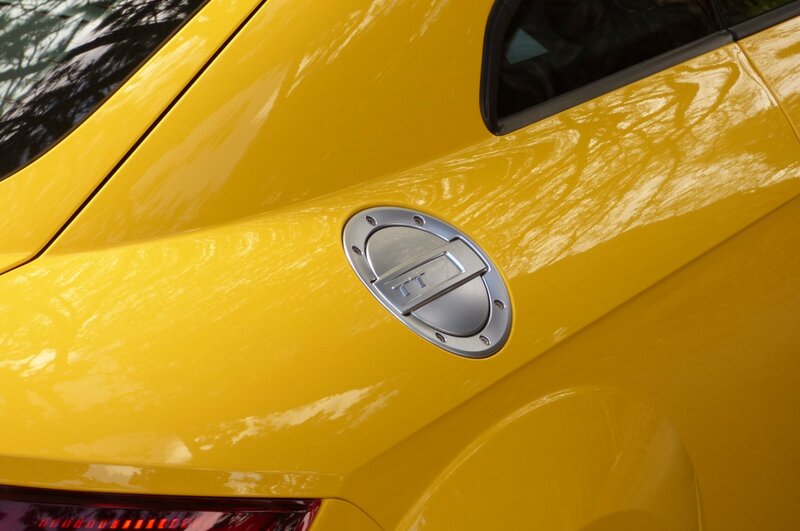 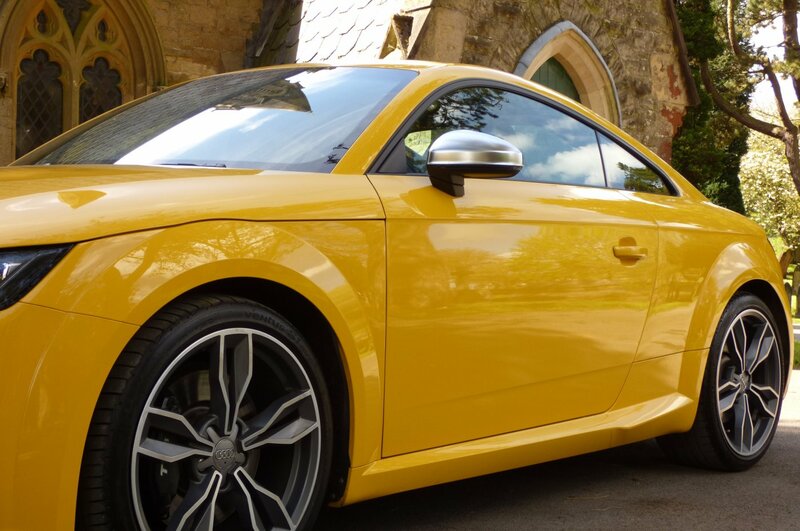 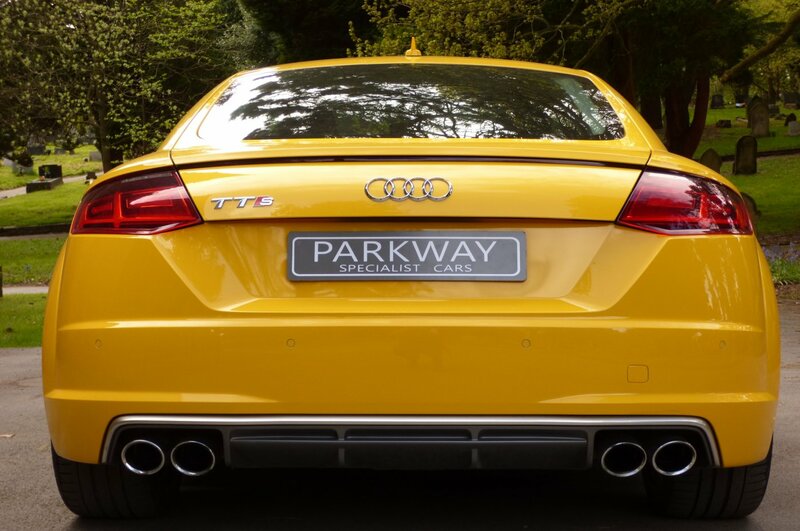 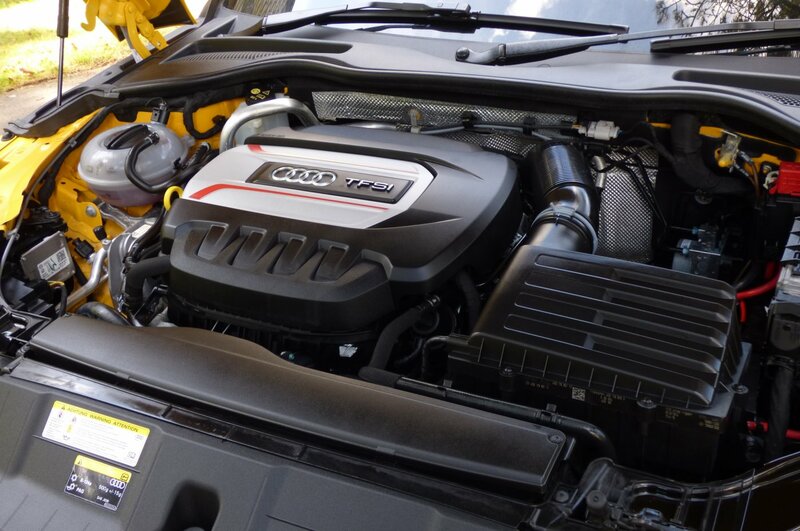 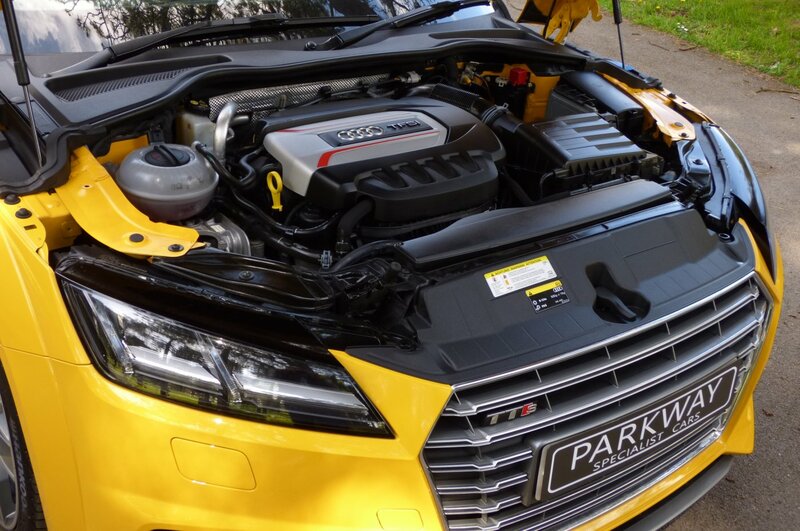 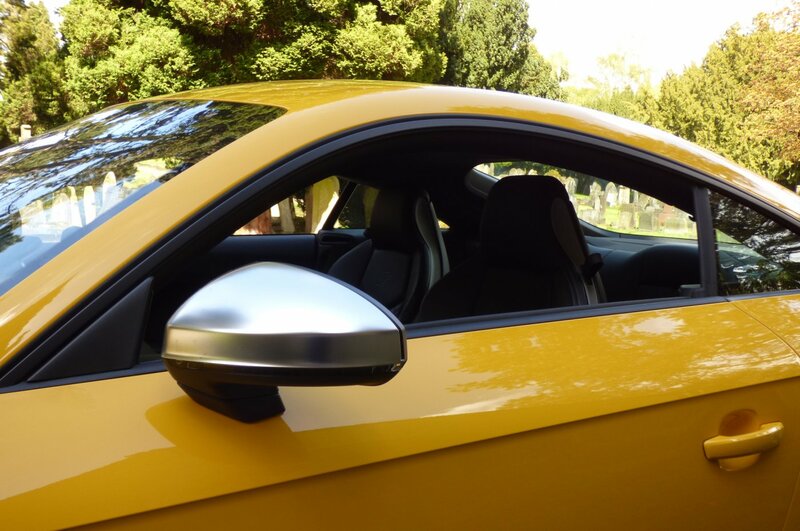 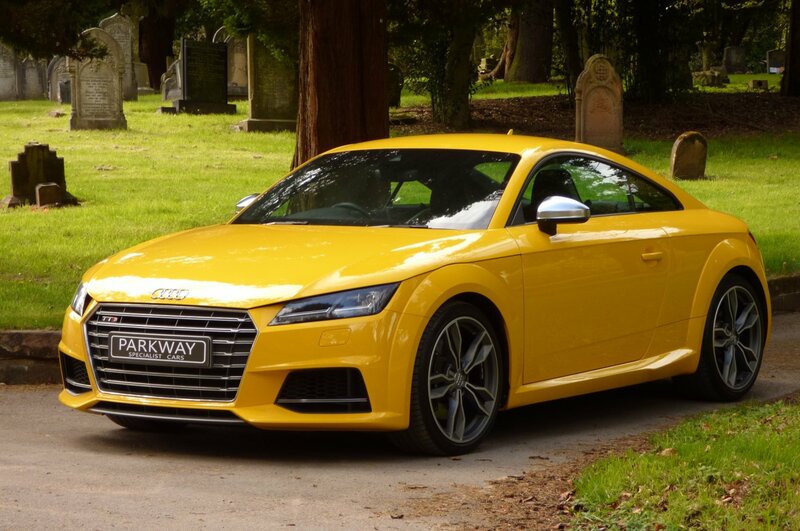 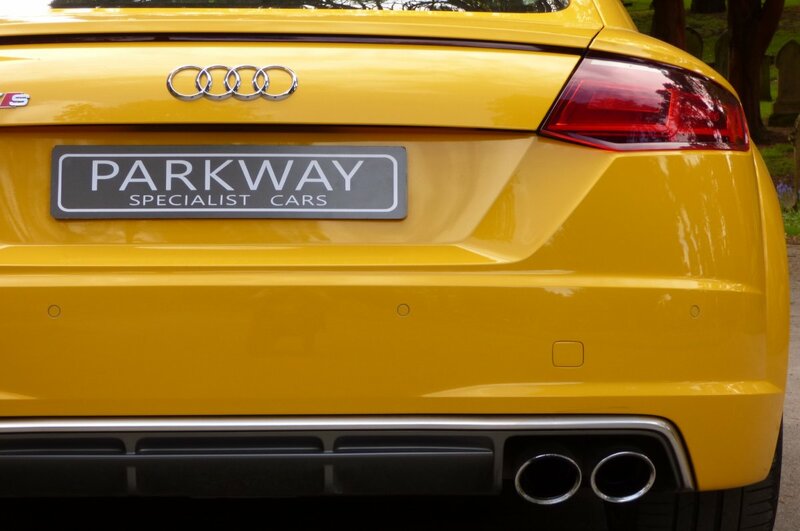 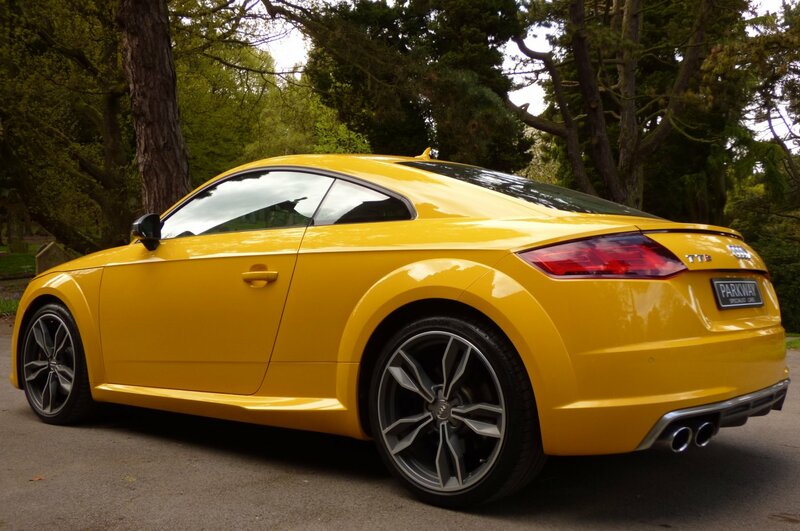 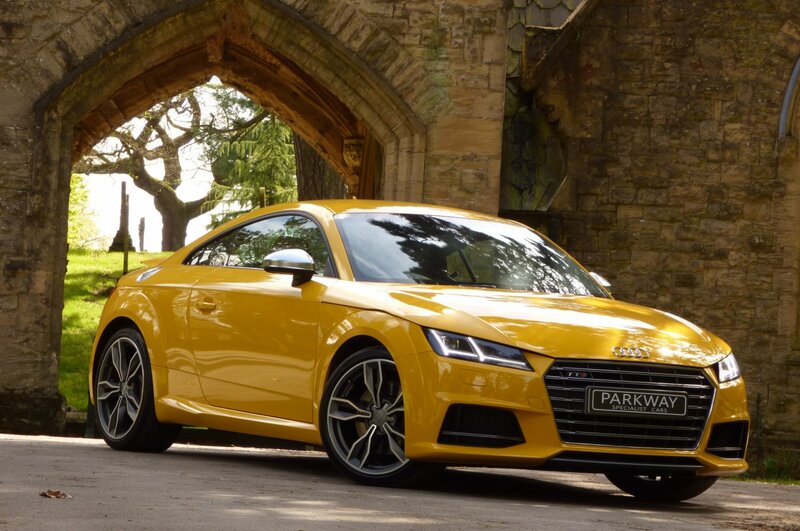 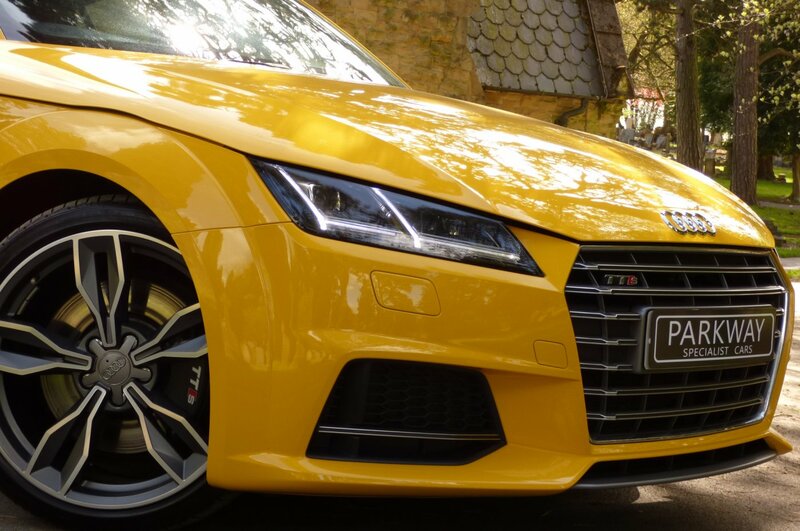 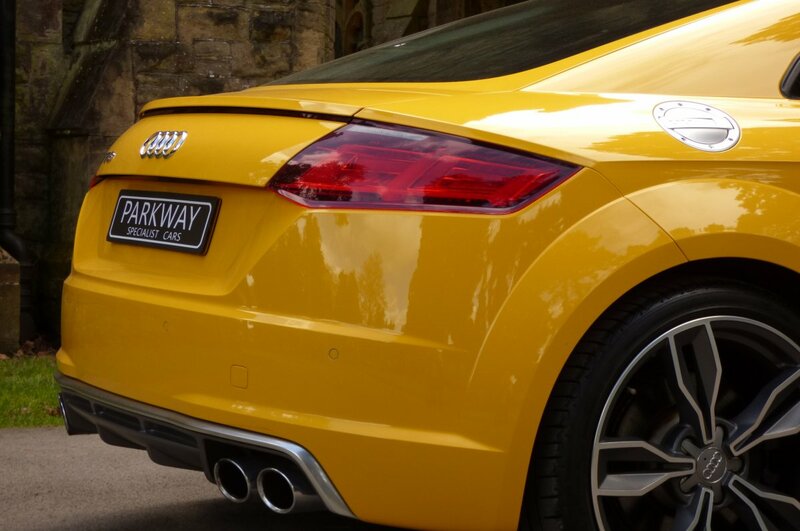 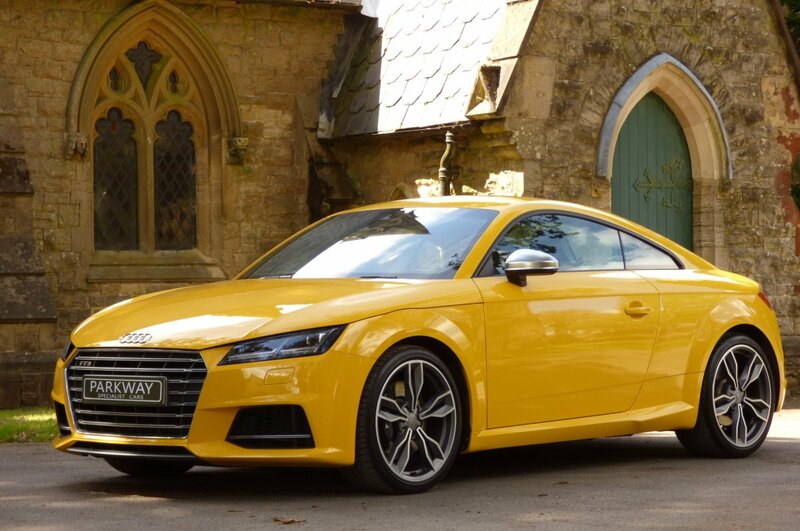 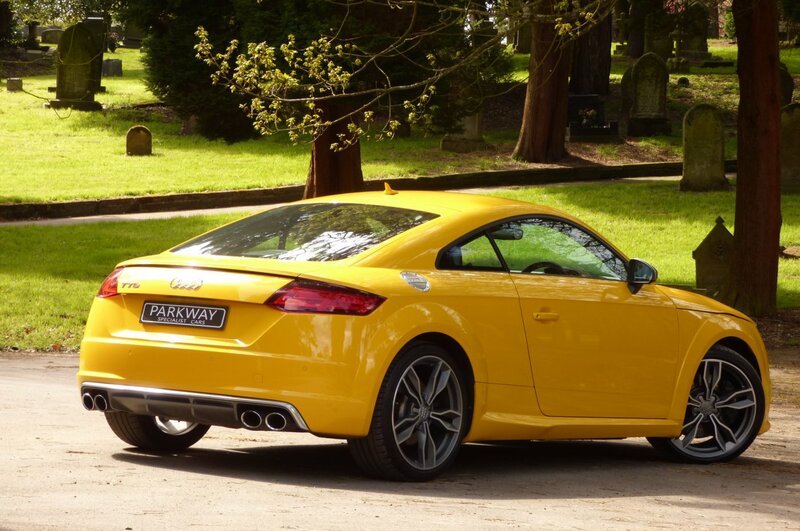 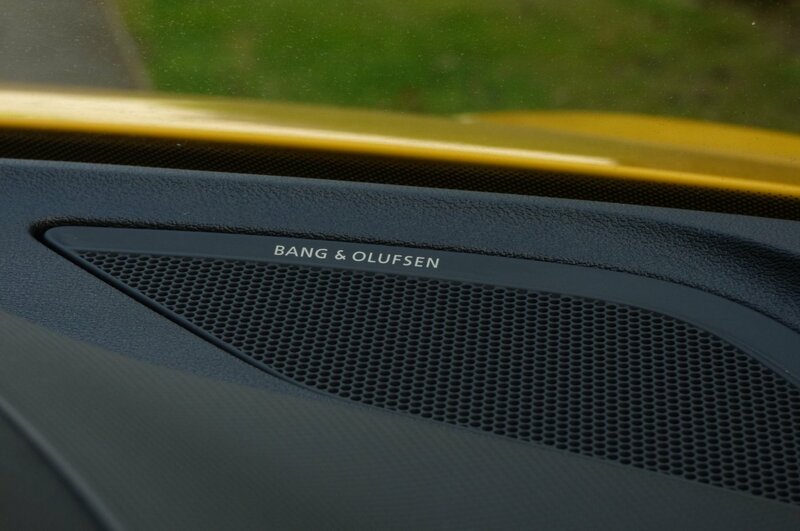 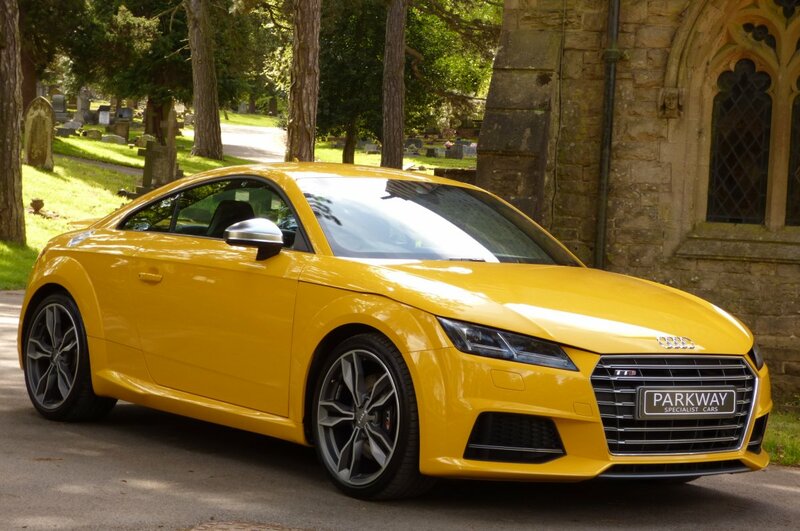 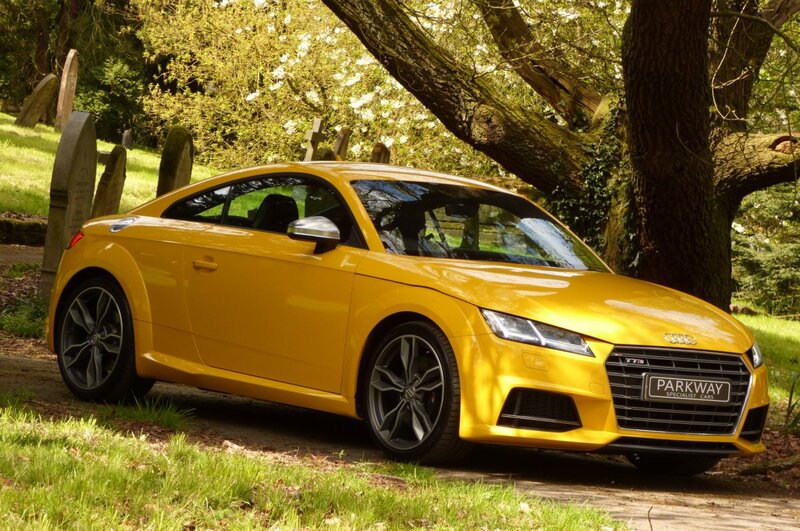 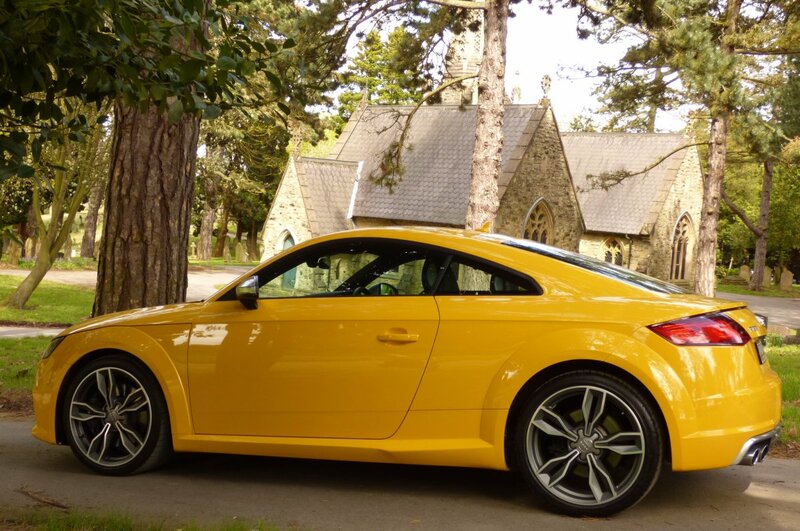 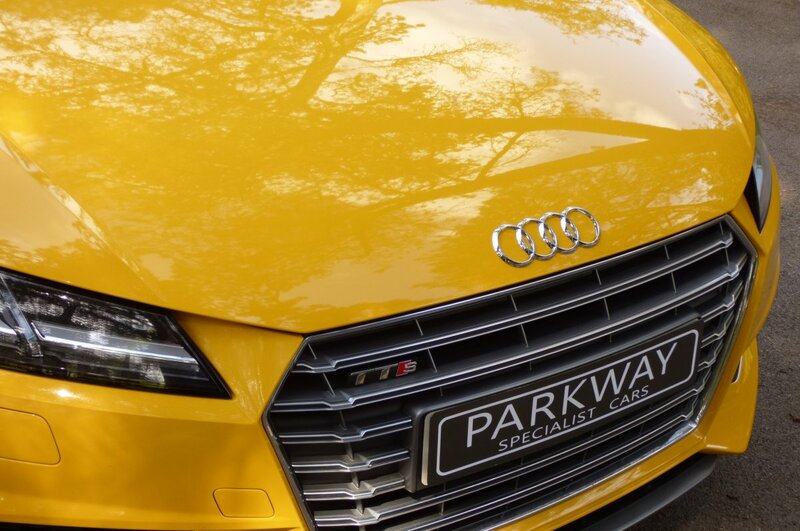 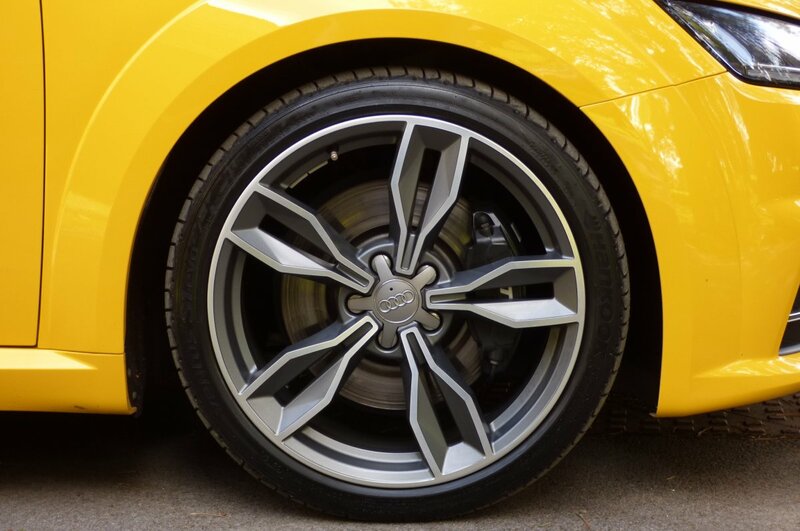 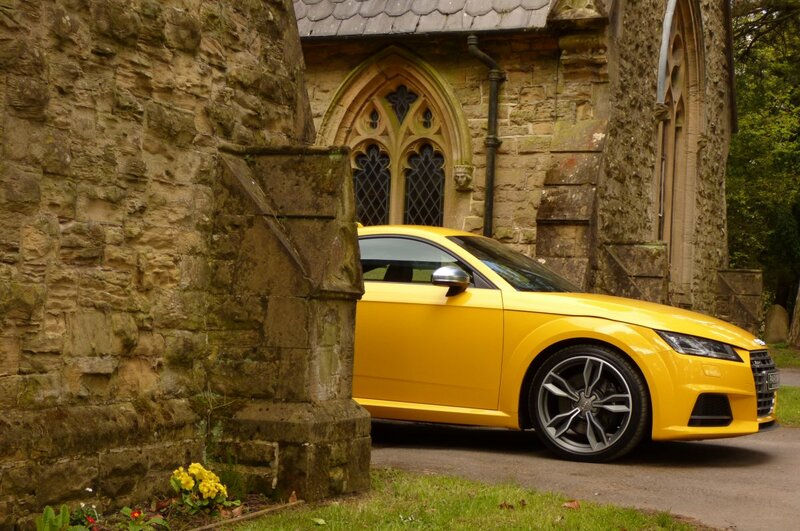 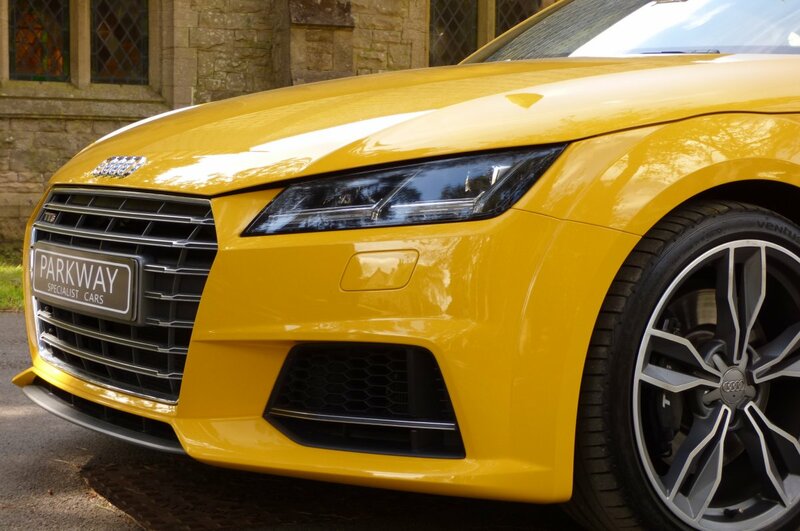 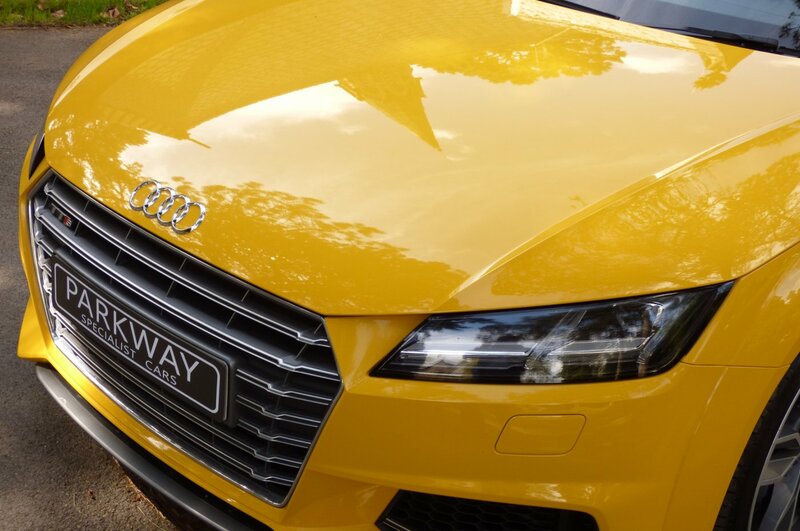 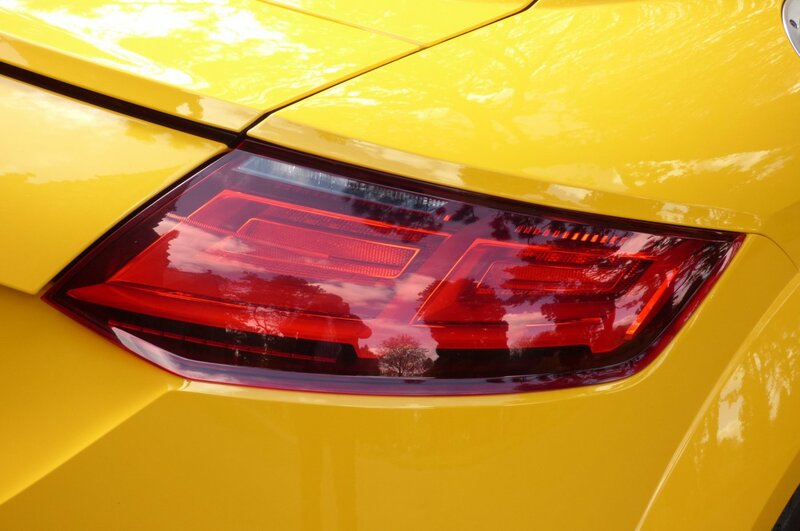 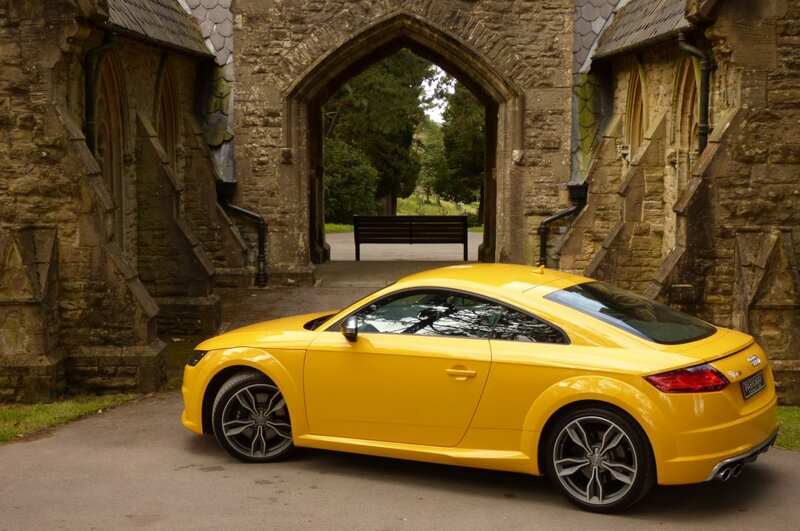 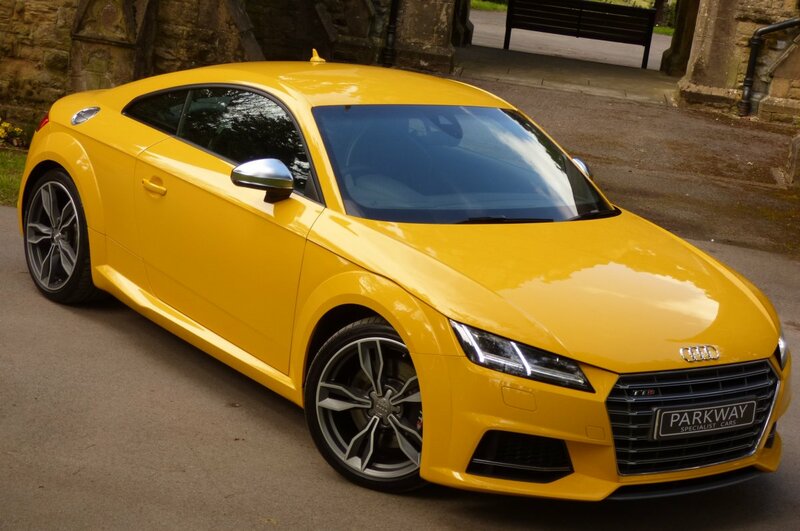 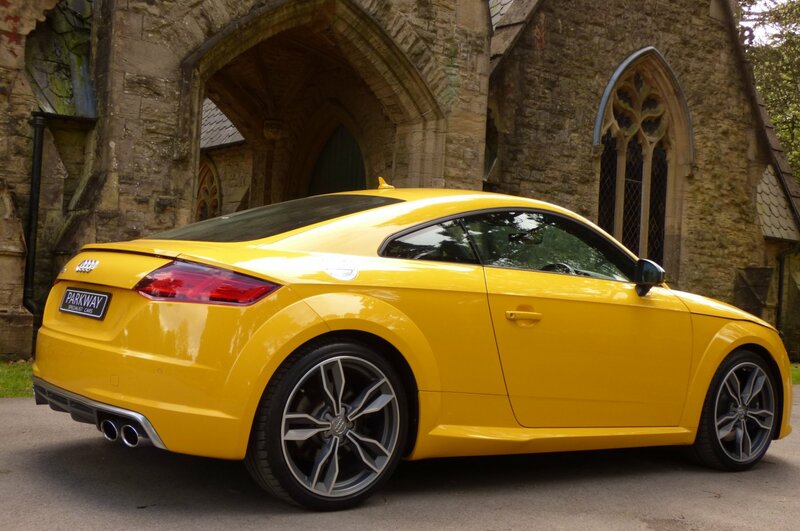 The Audi TT Has Always Been A Stylish Sporty Coupe Since Its Arrival In 1998 And Our 2015 TTS Is No Different, With The Vegas Yellow Paint Finish Perfectly Demonstrating The Fresh Modern Day Design, The Aggressive TTS Curves And The Sublime Audi Body Lines. 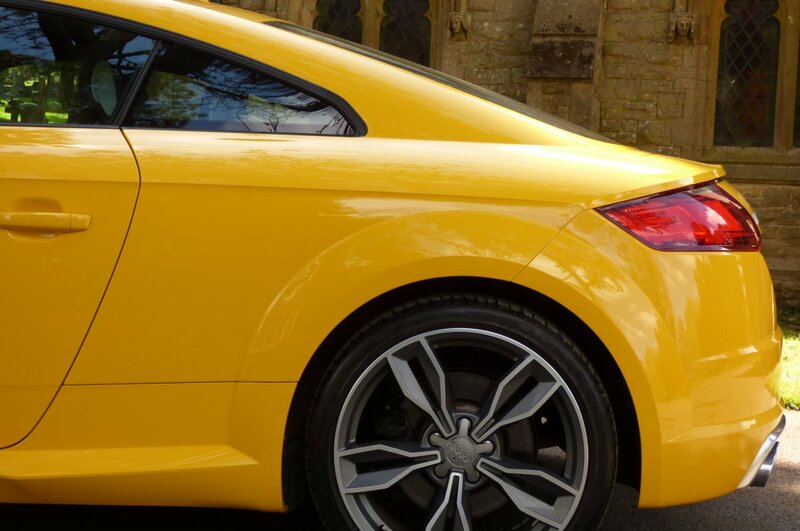 Further Exterior Detailing Is Presented With The Unmarked 19" 5-Parallel Spoke Star Alloy Wheels Which All Sit On Branded Tyres, The Brushed Aluminium Door Wing Mirror Cases, The Electrically Retractable Rear Boot Spoiler, The Deeper Set Colour Coded S Bumpers, The Chromed Tipped Quad Exhaust Pipes, The Blackened S Embossed Brake Calipers, The Colour Coded Roof Mounted Shark Fin, The Bright Chromed Front Grille Decorated With The TTS Motif, The Factory Chromed Front Bumper Lower Valance And Is Presented With The Signature Audi Badges, That Finish This Stunning Vehicle Stance. 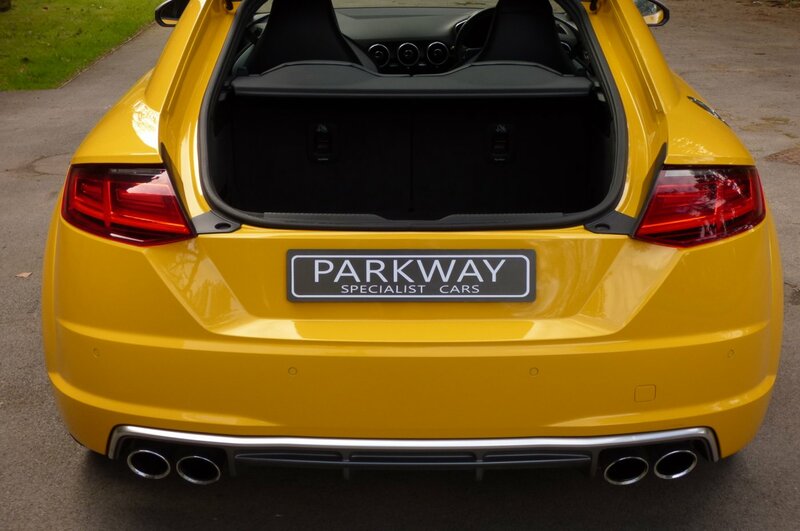 The Car In This Colour Configuration Looks Staggeringly Beautiful From Every Given Angle And Would Be Perfect For That Drive Into The City Or As The Weapon Of Choice To Tackle That Planned European Adventure. 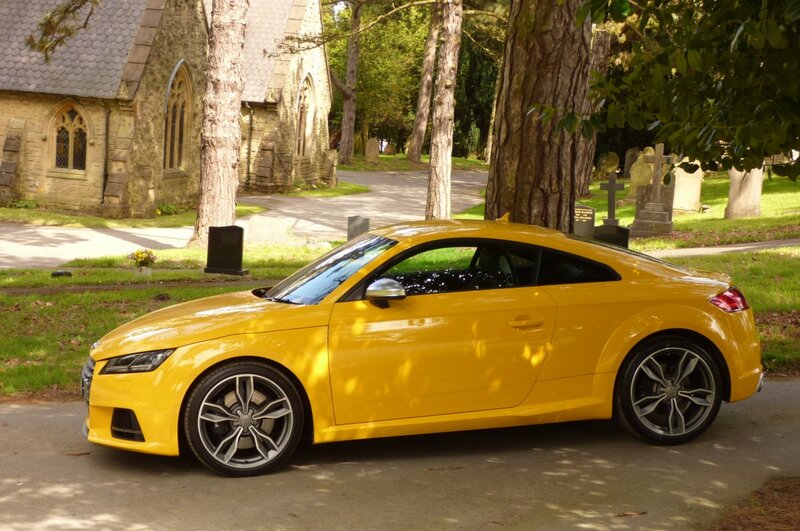 This Lovely Low Mileage Example Comes With Superb Factory Audi Options From New To Include The Audi Virtual Cockpit With MMI Navigation System Plus, Unmarked 19" 5-Parallel-Spoke Star Alloy Wheels, Bang & Olufsen Sound System, Retractable Rear Colour Coded Spoiler, Rear Parking Sensors, Audi Phone Box, DAB Digital Radio, Bluetooth Phone Preparation, Auto LED Headlights, High Beam Assist, Daytime Running Lights, Auto-Dimming Rear-View Mirror, Electric Heated Wing Mirrors, Rain Sensing Auto Wipers, Audi Active Lane Assist, Audi Drive Select, Electric Parking Brake, Automatic Electric Climate Control With Integrated Displays, Leather Package, Electrically Adjustable Front Seat Heating, Variable Heated Front Seating, Flat Bottomed Multi-Function Leather Steering Wheel, Start-Stop System, Audi Advanced Key System, Audi Storage Package And So Much More.  Presented With The Entire Booklet Pack Set, A Cleared HPI Report And Fully Functional Key Set.